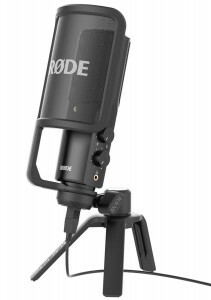 The Rode NT1-A has long been a stable condenser microphone in home project studios. 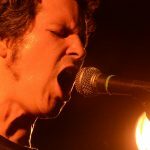 Since they’ve built a reputation for good entry-level gear it makes sense that Rode has introduced a USB mic as these are generally geared towards the same audience that seeks bang for the buck. A pop filter doesn’t usually seduce me, but this is an exception. It’s the standard to toss in a micro stand with a USB mic, and now Rode has sweetened the deal by adding a super sleek pop filter. It’s perfectly proportioned to the NT-USB’s dimensions and sans the often unwieldy and pointlessly versatile gooseneck. The Rode records at a maximum resolution of 16-bit at 48kHz. This can still be considered the norm for USB mics. 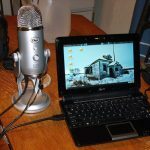 Close competition such as the Blue Yeti Pro and Apogee MiC 96k can do 24-bit and for not much more money. If your content is YouTube-bound the NT-USB’s specs are just right but for more serious music applications especially jumping up to 24-bit is well worth it. 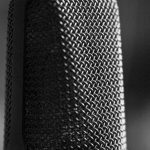 There are two knobs nicely placed at the side of the mic that control monitoring. One knob controls the minijack headphone output level and the other sets the balance between the dry sound at source and the signal coming back from your computer. The blend feature is pretty unique and useful if you’re particular about latency or adding effects such as reverb while you track. No extra drivers are needed to make these functions work; the NT-USB is a class compliant device. This is a huge plus as it’s frustrating to invest in a USB mic or audio interface only to find the driver is no longer supported by a new OS years down the line. It works with an iPad but you’ll need Apple’s Camera Connection Kit or similar. 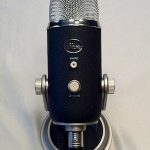 The NT-USB is a cardioid pattern mic with no extra fancy features such as a pad or low frequency roll-off switch. Frequency response goes from 20Hz to 20kHz, equal to the Blue Yeti and better than the Blue Snowball. There is an upper mid-range boost for a more flattering sound. Giving you a pretty polished result without a lot of EQ. This is a well-constructed mic with some great extras: pop filter, micro stand, and generous 20-foot USB cable. It would have been nice to have 24-bit recording capability but considering the extras and pro-standard capsule the price seems about right. Built-in monitoring features that go beyond the norm is another aspect that make this mic shine. 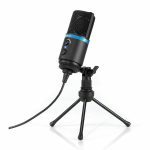 The Rode NT-USB may be a Yeti killer for podcasters wanting a bit more without stepping up to the Yeti Pro. 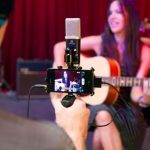 Apogee JAM and MiC: Best Travel Recording Options Yet?